When it Comes to Keepsakes, What’s the Difference Between Physical and Digital? by Bill LeFurgy • February 19, 2014 • Comments Off on When it Comes to Keepsakes, What’s the Difference Between Physical and Digital? I’m cleaning out my office in preparation for retiring on March 7. I’ve accumulated a few mementos during my career, and moving them out stirs up memories. 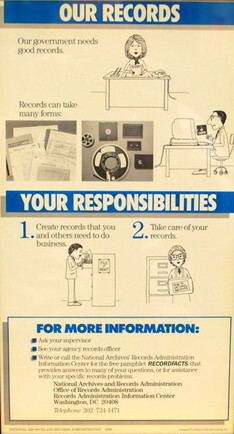 One of my favorite keepsakes is a framed 1986 poster from the National Archives and Records Administration that proclaims “Our Records, Your Responsibilities.” It offers little in the way aesthetics (to put it mildly) but it always evokes memories of working with a wonderful group of people on projects with meaning and purpose. The association is powerful–it reaches into my ideas about professional identity, government service and striving for big goals. I well remember where the poster originally hung in the old office 25 years ago and how happy I was to get it as a parting gift when I moved on to the next job. It’s slowly turning brown around the edges, and that visible aging is a poignant reminder about how much time has passed. Objectively I agree it’s a little weird to get misty-eyed over a records management notice. But that’s the nature of memory tokens: they’re symbols for significant feelings and ideas about who we are. They help us mark meaning in our lives. But is there a difference between physical and digital mementos? For me there is. Now, I affirm that all keepsakes vary in the degree to which they resonate in our hearts. But there is something slippery and uncanny about a digital object as a memory token. First and foremost there’s the question about where and what the object is. Unlike my poster, a digital file can’t sit in plain sight. It requires a machine to view. The object also can be hard to find in the first place because it likely lives with thousands of others in a virtual environment that may be difficult to navigate. There can be multiple copies, some identical, some not. Consider the digital photograph to the left, which I took in 2005. 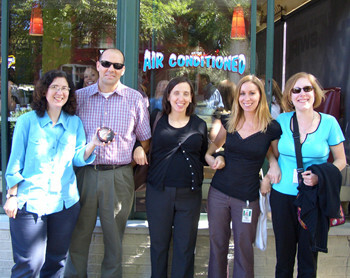 It shows a group of people I worked with on NDIIPP projects at the time, and the photo evokes plenty of memories, some of which had lain dormant for years. Interestingly, the picture is both more and less suggestive than the physical poster. It’s more evocative in that it suddenly restores details and associations that had faded in my memory. But it’s less evocative for the same reason–there’s no patina, no natural aging of the artifact to burnish its emotional meaning. The picture seems to have just popped out of a wormhole. But there is more involved in the difference between digital and physical keepsakes. The idea for this post struck me as I was packing up my old NARA poster. Seeing it, touching it in the context of my looming retirement automatically led to thoughts about the function of personal mementos. I could have picked another similar object at hand, such as the black basalt cobblestone I picked up on an Oregon magic beach during a work trip to examine Bonneville Power Administration records, or maybe my framed quote from Ecclesiastes 9:11. I had placed all them close to where I work to serve some kind of emotional-spatial-identity purpose, and each of them regularly leap into my sight and into my awareness. My digital mementos, however, are hidden on machines and media. I have a vague sense of what’s there, and I have organized my files somewhat. But I’m hazy about the individual items, both because I only view them occasionally and because there are so many of them. When I started this post I knew I would have to pick a digital file as an example–but I wasn’t sure which one. I had to hunt my hard drive to find the right image to compare with the poster. It’s like some kind of strange quantum mechanics effect: the memento function only takes place when I choose to look for a particular digital photograph; when I’m not looking, all the potential memories exist in an undifferentiated cloud of bits. The issue here is that it’s harder for me to form an emotional connection with a cloud of bits than it is with an object I am familiar with on an everyday basis. I’m going to preserve my digital photographs, of course, because of am aware of their potential emotional significance. And in retirement, maybe I’ll have time to figure out a way to interact more routinely with my digital mementos and form stronger bonds with them. On thing is for sure, though: that funky old poster is going on the wall next to my home work space. This is a syndicated post. Read the original at The Signal: Digital Preservation 2014-02-19. ← Opening Science: The evolving guide on how the Internet is changing research, collaboration and scholarly publishing.